Until a couple of years ago, my hair seemed problematic to everyone. Photographs show that the early years went relatively well. 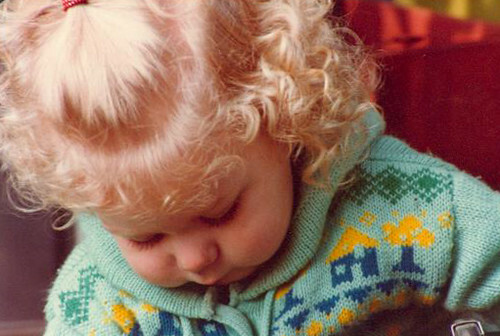 As a cherub-faced toddler, flaxen ringlets cascaded gently down the sides of my head. A little frizzy perhaps, but there was a general consensus by all that I had curly hair. By kindergarten, my hair had grown to waist length. My straight-haired mother would braid it each night before I went to bed so it wouldn’t get horrifically tangled (the worst tangles were always at the nape of the neck). After a bath, she would apply some leave-in conditioner, comb it out, braid it, and when it had finally dried, I chalked any curliness up to the braids. If that wasn’t enough trouble, at school, the metal rivets on the backs of the chairs would pull my hair out, a few strands at a time, nearly every time I got out of my chair or turned my head. Pretty painful for a five year old! When I was in second grade, I decided to cut the length off. That’d solve everything, right? My mother told me that I would still want bangs, and since my mother knows everything(! ), I trusted her judgement. My hair seemed to mostly act straight, and any memory I had of having ever had curly hair faded away. Soon though, I started getting small pieces (especially the edges of the bangs!) that would randomly stick up like a wing on the side of my head. The only relief was during the few minutes it would stay tucked behind my ear. It wasn’t long before another wing sprouted on the other side. I kept careful watch over my head to make sure it didn’t fly off to Baltimore without me. Throughout the rest of elementary school, I tried other control tactics, like a perm(!) in fourth grade, and in sixth grade, I just started pulling up the canopy of my hair into a barrette, teasing and hairspraying my bangs into reaching for the stars in submission. It just never really looked all that great, but I was perpetually befuddled about what to do. Diverging from my mother’s input, in seventh grade, I took creative control and made my bangs part of my hair again. I even stopped brushing my hair for a period. My locker mate teased me about this, but the fact was that it looked better than it almost ever had. In eighth grade I cut my hair into a bob, the style it mostly remained in for the next ten years. Whenever I would get my hair cut, people would say my hair had “the perfect amount of curl,” whatever that meant. Depending on the circumstances it might be a little wavy in the morning, but it would usually go limp rather quickly. On rainy days my hair would sometimes even look a teeny bit curly. There were a couple of times I used foam curlers for high school theater productions, and was very surprised how great it always turned out, and how long it stayed in place. Friends always complained that their hair never held the curl long, if at all. I usually shrugged, not knowing how to explain my luck. 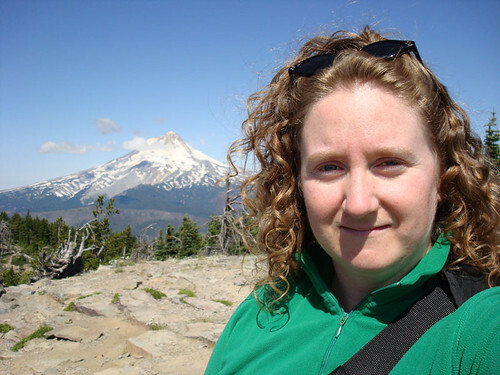 After having success with another lifestyle experiment, late in 2006 I decided to see what would happen if I started trying to encourage the curl instead of being apathetic about it. 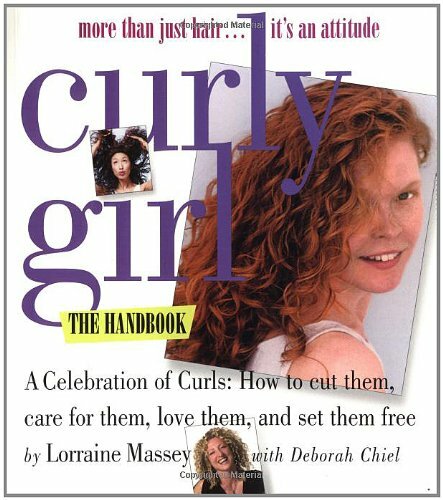 Internet research quickly led me to the book Curly Girl by Lorraine Massey with Deborah Chiel. According to the book, some pretty radical changes would be necessary if I wanted to see how curly my hair truly was. No normal blow-drying. No brushing. And this is the one that always surprises people–no more shampoo. That’s right kids, I haven’t shampooed my hair since February 2, 2007. And it has never looked better. This process quickly revealed a head full of beautiful Botticelli ringlets like the ones in my baby photos, so it only took a couple of months for me to reclassify this project from an experiment to a full-fledged lifestyle change. Shortly thereafter I also discovered NaturallyCurly.com, where I learned even more: plopping, a more detailed hair-typing system, new products to try, and more. For many years, I wasn’t able to grow my hair past shoulder length, as it would start looking wretched and be completely unmanageable. I would get a haircut about every 3-4 months. Now I can easily go a year between haircuts. My hair reaches far beneath my shoulders and if the attention it gets from friends is any indication, it’s looking better than it ever has! After years of following the same old thing unquestioningly, I reaped big rewards trying something radically different. Discovering how to properly care for my hair was thrilling, and such a successful experiment will serve as inspiration for future experiments I undertake.